Among the differently recorded tooth malformations, dens invaginatus (DI) is a generally common genetic incongruity resulting from an infolding of enamel organ into the dental papilla at varying depths, before the tooth calcification. It was first portrayed by “Ploquet” in 1794 in a whale tooth; later in the year 1855, Salter depicted it as a “tooth inside a tooth.” In the year 1856, a dental practitioner named Socrates depicted DI in a human tooth. DI has been classified into the following three types according to the depth of penetration and communication with periapical tissues or periodontal ligament. Type III: in this type of DI, the invagination extends beyond the CEJ through the root and exhibiting a second foramen in the apical third with the periradicular tissue. DI has numerous equivalent words, and various terms have been utilized to portray the condition-like dens in dente, dentoid in dente, tooth within a tooth, invaginated odontome, dilated composite odontome, tooth inclusion, dents telescope, and gestant anomaly. The prevalence of DI ranges from 0.04% to 10%. Hülsmann revealed a maxillary predominance with a bilateral pattern of involvement with high incidence present in maxillary lateral incisors (75%) accompanied by mesiodens (9%), followed by maxillary central incisors (6.8%), premolars and then canines. As far as mandibular occurrence is concerned it is found to be extremely rare with only a few cases reported up to now. It may occur in any teeth, including deciduous and supernumerary teeth. The condition is observed mostly in single form with a rare incidence of double and triple forms., Multiple DI and bilateral occurrence have often been found., The root canal anatomy of DI involved tooth can be very unpredictable. Multiple canals have been found rarely in cases of DI. In this case report, an attempt has been made to discuss an unusual case of multiple DI, diagnosed and managed by using cone-beam computed tomography. A 23-year-old male patient reported with a chief complaint of discharge of pus from upper and lower front region for the past few days. There was no history of trauma and/or discoloration of the tooth. Medical history was noncontributory. Clinical examination revealed a sinus tract on the labial mucosa near teeth 12, 22, 33, and 42 [Figure 1]a, [Figure 1]b, [Figure 1]c. Deep grooves on the labial surface extending beyond the gingival margin apically were associated with teeth 21 and 33 [Figure 1]a and [Figure 1]c. Exaggerated labial cervical prominence with an abnormal crown–root angulation was also present in teeth 33 and 43 [Figure 1]c. Deep palatal grooving and prominent cingulum were noted in association with teeth 11, 12, 21, and 22 [Figure 1]d.
Radiographic examination revealed that teeth 11, 21, 12, 22, 13, 23, 33, and 43 had DI morphology [Figure 2]a, [Figure 2]b, [Figure 2]c, [Figure 2]d. The periapical radiolucency was associated with teeth 11, 12, 21, 22, 33, 42, and 43. The sinus tracts were traced with gutta-percha cone to 12, 22, 33, and 42. Thermal and electric pulp testing (Digitest Pulp tester, Parkell, Inc, Edgewood, NY, USA) showed negative responses in teeth 11, 12, 21, 22, 33, 42, and 43 and positive response in teeth 13 and 23. No mobility was noted, and all teeth were nontender to percussion. Teeth 21 and 43 represent a combination of coronal (Type II) and radicular dens in dente. Multiple periapical lesions suggestive of chronic periapical abscesses were present involving the teeth 11, 12, 21, 22, 33, 42, and 43. 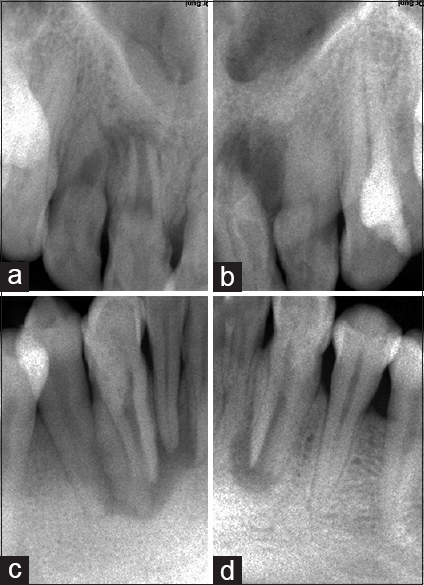 Wide root canals without apical constriction and open apices were noted in teeth 11, 21, 33, and 43 [Figure 3] and [Figure 4]. Nonsurgical endodontic treatment of the teeth, including placement of a calcium hydroxide dressing over several appointments, was formulated as a treatment plan. A strong possibility of surgical intervention was also considered. The treatment plan was informed to the patient, and his consent was taken. In the subsequent appointment, the endodontic access opening with 11, 12, 21, 22, 33, 42, and 43 was done under rubber dam application (Hygenic dental dam, coltene whaldent, Switzerland) with a tapered safe-ended endoacess diamond point (Dentsply/Maillefer, Baillagues, Switzerland). The main and the invaginated canals were located in teeth 11, 12, 21, 22, 33, and 43 and the primary canal was located in tooth 42. The canals were cleaned and an electronic apex locator (Root ZX, Morita, Tokyo, Japan) was used to determine working length followed by radiographic confirmation [Figure 5]a, [Figure 5]b, [Figure 5]c, [Figure 5]d, [Figure 5]e, [Figure 5]f. The canals were shaped with a crown down approach using k-files (Maillefer, Ballaigues, Switzerland) in combination with gates glidden. Endosonore files (Endosonore, Dentsply Maillefer, USA) were used in combination with Start X n°3 ultrasonic tip (Start X, Dentsply Maillefer, Switzerland) and dental operating microscope to remove the invaginations and to convert it into single large canals. Sodium hypochlorite (2.5%) and ethylenediaminetetra-acetic acid- (17%) solutions were used as irrigants. The canals were dried with sterile paper points, calcium hydroxide (Ultracal XS; Ultradent, south Jordan, UT, USA) was placed inside the canals of teeth 11, 12, 21, 22, 33, 42, and 43 and the access cavities was temporized with cavit G (3M ESPE, Seefeld Germany). This was changed every 2 weeks for 2 months. At the end of 2 months, the canals in teeth 11, 12, 21, 22, 33, 42, and 43 appeared dry with no exudates and bleeding. Pro Root MTA (Dentsply Tulsa Dental Company) was used to create 4 mm apical plug and wet cotton moistened with distilled water was left inside the canals for 48 h for the setting of MTA. In the subsequent appointment, the canals were filled with thermoplastisized gutta-percha and sealer (AH plus, Dentsply DeTrey, Konstanz, Germany) [Figure 6]a, [Figure 6]b, [Figure 6]c, [Figure 6]d, [Figure 6]e. The access was then permanently restored with a nanofill resin composite (CLEARFIL MAJESTY Esthetic, Kuraray, Medical Inc., Japan). Unfortunately, the patient returned after 2 months with a complaint of pain and swelling in labial gingival of teeth 12, 22, and 43. Teeth 12, 22, and 43 were tender to percussion. Due to lack of time the patient requested a quick and thorough treatment. Taking this into consideration, surgical treatment was planned about teeth 12, 22, 42, and 43, and informed consent was provided by the patient. 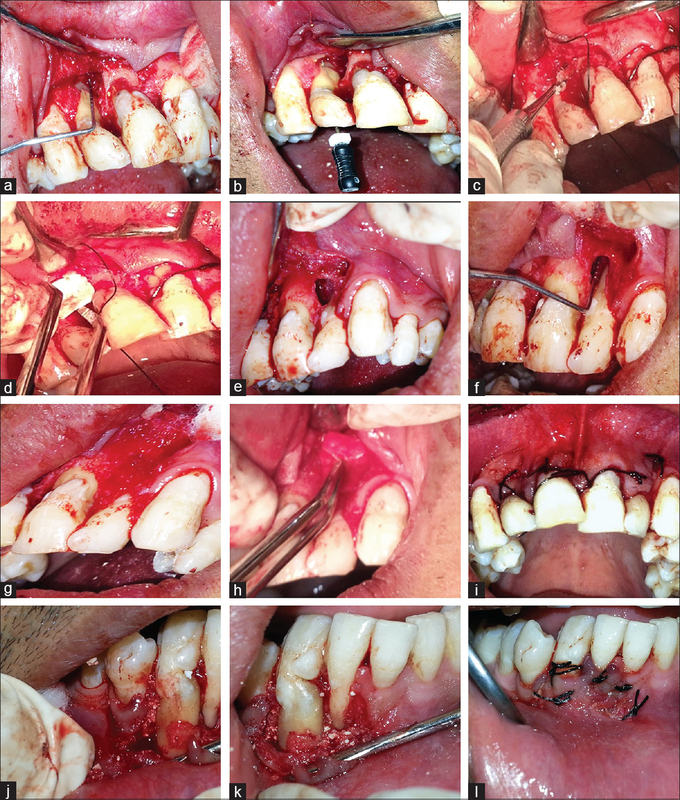 For the surgical approach in teeth 12 and 22, local anesthesia using articaine with 1:10000 epinephrine, was administered and a labial full-thickness flap was elevated to expose the pathological area, and the granulomatous soft tissue involving the root apices were curetted [Figure 7]a, [Figure 7]e and [Figure 7]f. The apical foramen was located on the buccal aspect of root at the junction of apical and middle third in tooth 12 [Figure 7]b. The surgical region was irrigated with normal saline 0.9% and dried and the bony crypts were filled with a bone graft (Ossify, Equinox medical technologies, The Netherland, Holland) [Figure 7]c and [Figure 7]g and the grafting of biocompatible material was covered with a collagen membrane (Bio-Gide, Geistlich Pharma, Wolhusen Switzerland), suitably trimmed and shaped [Figure 7]d and [Figure 7]h. The flap was repositioned and sutured [Figure 7]i. The patient was prescribed antibiotics, analgesics, and mouthwash. One week later, the sutures were removed. There was no discomfort, and tissue healing had been achieved in the respective teeth. In the next appointment, endodontic surgery was performed in teeth 42 and 43. After local anesthesia using articaine with 1:10,000 epinephrine, incision, and elevation of a full-thickness flap, the granulomatous soft tissue involving the root apices were curetted [Figure 7]j. The surgical region was irrigated with normal saline 0.9% and dried and the bony crypts were filled with a bone graft (Ossify, Equinox medical technologies, the Netherland, Holland) [Figure 7]k and the grafting of biocompatible material was covered with a collagen membrane (Bio-Gide, Geistlich Pharma, Wolhusen Switzerland), suitably trimmed and shaped. The flap was repositioned and sutured [Figure 7]l. Sutures were removed 1 week later. There was no discomfort, and tissue healing had been successfully achieved. At 6-months follow-up, the patient had no discomfort and there was no evidence of sinus tract. A panoramic radiograph revealed the progression of hard tissue healing with increased radiodensity at the site of bony defects. At 1-year follow-up, the teeth were asymptomatic and functional. On the buccal aspect, there was no evidence of the sinus tract; however, some gingival recession was present in teeth 42 and 43 [Figure 8]. 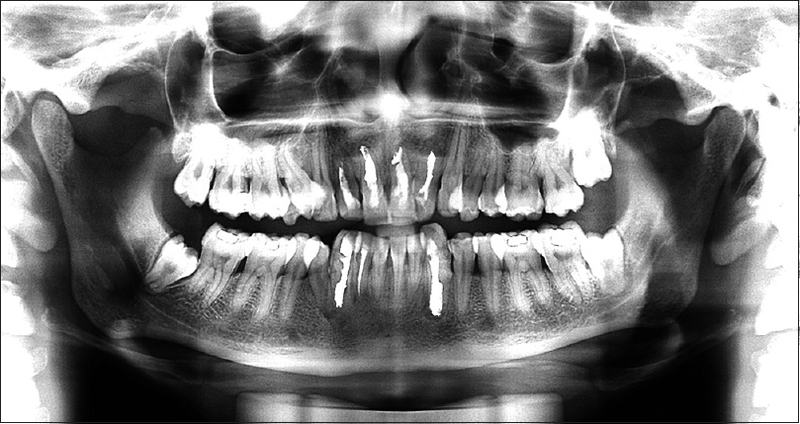 Panoramic radiographic examination revealed complete resolution of periapical lesions [Figure 9]. DI as a dental anomaly suggests a broad spectrum of morphologic variations and predisposes the tooth to decay and in intense invaginations to pulpitis and apical periodontitis. The endodontic or combined endodontic-surgical treatment is often required in the involved tooth which is difficult to perform because of the abnormal morphology. Endodontic management of tooth involved with invaginatus is a difficult procedure as the canal anatomy often is irregular and also the apex is not completely formed. In addition, the invagination hinders the channel at completely different levels. It is not easy to completely orchestrate the root canal system of involved teeth due to these complexities. The best-recommended management of involved tooth is a combined endodontic and surgical treatment. It has been advocated that nonsurgical root canal therapy was performed as the initial treatment whatever be the size of periradicular lesion and the combined treatment should be advised in those cases where the orthograde treatment has been unsuccessful, or if the teeth have abnormal anatomy of root canals that hinders proper access and cleaning of the root canal complex. In the present case report, regarding the modality of treatment, in teeth 11, 21, and 33 nonsurgical treatment was performed with success. The use of calcium hydroxide as an intracanal dressing followed by orthograde apical MTA Plug resulting in substantial healing of lesion noted at 1-year follow-up. For endodontic treatment to be successful, the complete debridement of the necrotic tissue from the root canal complex is very essential. A tooth involved with DI has canal irregularities that are difficult to instrument and clean such as dips, concavities, intra-canal communications, inaccessible fins, apical ramifications, because of the difficulty of reaching instruments in these areas. In the present case, the invaginated hard tissue occupies and constricts the canal differently at different levels in involved teeth making the significant areas inaccessible to instrumentation. The invaginations acted as an obstruction and inhibit complete chemomechanical cleaning of the root canal complex, so it was removed in each tooth and transformed into a single canal to facilitate nonsurgical root canal treatment. Several successful cases with removal of invagination have been described in the literature., The removal of invagination was feasible in this study with the combined use of ultrasonic instruments and the operating dental microscope. Several published case reports have shown the successful removal of invagination with ultrasonic techniques under the microscope, which saved a significant amount of tissue., Passive ultrasonic irrigation technique was used during the instrumentation because activated irrigants are more efficient in removing affected dentin debris and considered suitable for the treatment of noncircular canals as those in teeth affected by DI. This procedure could have facilitated proper debridement of the canal space that was not accessible. In the present case, calcium hydroxide intracanal medicament was inserted in root canals between appointments to disinfect the root canals, reduce bleeding, exudation, inflammation of the periradicular tissues, and to stimulate the deposition of hard mineralized tissue in the apical area. 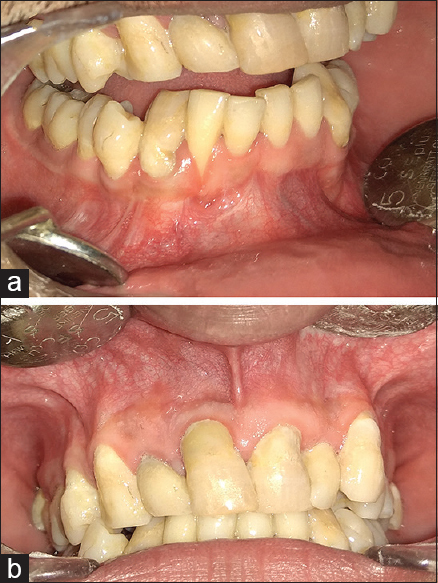 This methodology prompted the clinical accomplishment in three teeth without the requirement for periapical surgery. This information proves the reports of other authors that showed the effect of calcium hydroxide as an intracanal medicament, and the obturation with calcium hydroxide-based cement for the healing of repair of periapical radiolucency in teeth with mature apexes. The major problems encountered in conventional root canal therapy in nonvital teeth with open apex are the complete closure of the immature apex. The utilization of MTA for root end closure instead of calcium hydroxide has turned out to be progressively far-reaching. Several researchers have proven the benefits of MTA as apical plugs in open apex cases with fulfillment., It has been shown by several studies that, MTA presents scaffolding for the formation of hard mineralized tissue and an excellent biological seal possibly because it is biocompatible, have an alkaline pH, and liberate materials that lead to activation of the cementoblasts, which further leads to matrix deposition for the cementogenesis., MTA might be used in the management of DI., Bogen and Kuttler in 2009, describe a case of type 2 DI with periapical periodontitis which was successfully managed using MTA as an apical plug. The introduction of CBCT leads to the revolution in the health area, which has helped in planning, diagnosis, therapeutic, and prognosis of dental abnormalities. 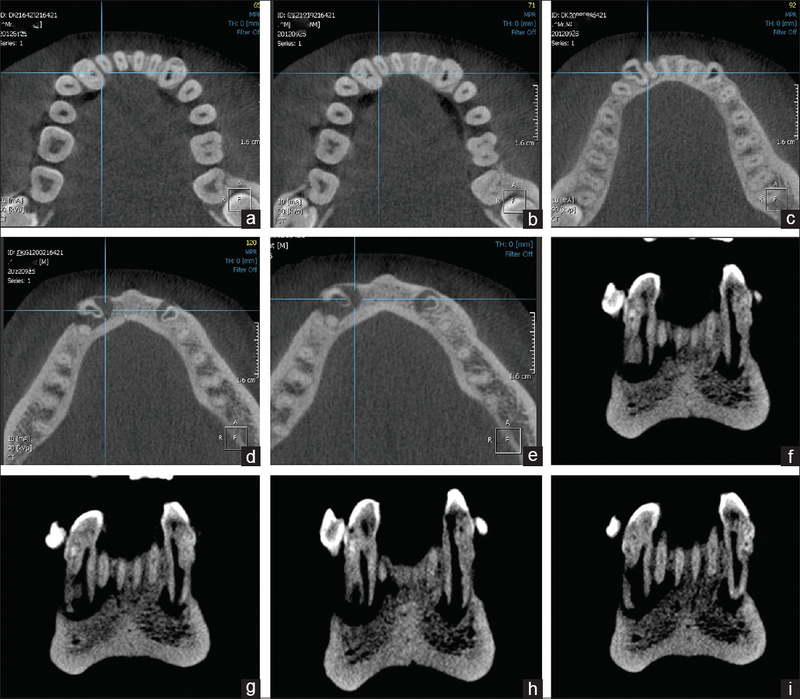 The CBCT imaging has provided new achievements in the diagnosis and management of complex cases. The benefits of CBCT in the clinical treatment of teeth with DI has been reported by many researchers in the literature., Patel reported that it is quite difficult to estimate the exact nature of DI from conventional radiographs and that CBCT is essential in diagnostic and management of this anomaly. The CBCT imaging performed in the present case provides three-dimensional reconstruction of the invaginated teeth which help us in understanding the complex intricate anatomical features of this unique case. It is important to understand that CBCT uses ionizing radiation and its use in dentistry is not without risk. Hence, the radiation dose should be kept As Low as Reasonably Achievable when used on the patients, and each radiation exposure must be therefore justified. In the past conventional radiographic examinations was mostly used to diagnose cases of DI. The conventional radiographic methods are insufficient in revealing the complex root canal anatomy of the invaginated tooth as they depict a 2-dimensional image of the 3-dimensional object. Now a days, 3D imaging like CBCT has evolved in dentistry which has shown efficient results in the diagnosis and management of DI cases with relatively low radiation doses. The success of present case confirms that MTA should be recommended as a material of choice to aid regeneration of the apical tissue in nonvital teeth with open apex and can be used in the treatment of DI. Hülsmann M. Dens invaginatus: Aetiology, classification, prevalence, diagnosis, and treatment considerations. Int Endod J 1997;30:79-90. Schulze C. Developmental abnormalities of the teeth and jaws. In: Gorlin RJ, Goldman HM, editors. Thoma's Oral Pathology. St. Louis: CV Mosby; 1970. p. 112-22. Silberman A, Cohenca N, Simon JH. Anatomical redesign for the treatment of dens invaginatus type III with open apexes: A literature review and case presentation. J Am Dent Assoc 2006;137:180-5. Oehlers FA. Dens invaginatus (dilated composite odontome). I. Variations of the invagination process and associated anterior crown forms. Oral Surg Oral Med Oral Pathol 1957;10:1204-18. Gustafson G, Sundberg S. Dens in dente. Br Dent J 1950;88:83-8, 111-22, 144-6. Hunter HA. Dilated composite odontome; reports of two cases, one bilateral and one radicular. Oral Surg Oral Med Oral Pathol 1951;4:668-73. Kronfeld R. Dens in dente. J Dent Res 1934;14:49-66. Alani A, Bishop K. Dens invaginatus. Part 1: Classification, prevalence and aetiology. Int Endod J 2008;41:1123-36. Monteiro-Jardel CC, Alves FR. Type III dens invaginatus in a mandibular incisor: A case report of a conventional endodontic treatment. Oral Surg Oral Med Oral Pathol Oral Radiol Endod 2011;111:e29-32. 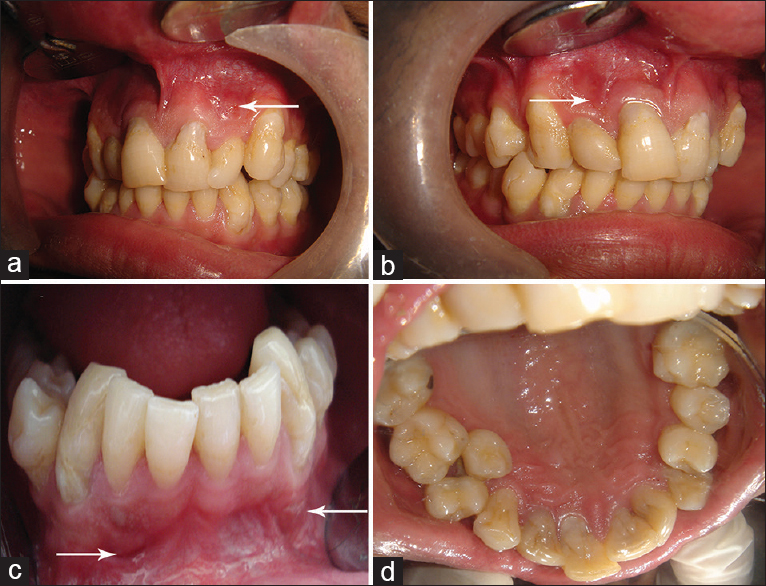 Nallapati S. Clinical management of a maxillary lateral incisor with vital pulp and type 3 dens invaginatus: A case report. J Endod 2004;30:726-31. Zengin AZ, Sumer AP, Celenk P. Double dens invaginatus: Report of three cases. Eur J Dent 2009;3:67-70. Serrano J. Triple dens invaginatus in a mesiodens. Oral Surg Oral Med Oral Pathol 1991;71:648-9. Canger EM, Kayipmaz S, Celenk P. Bilateral dens invaginatus in the mandibular premolar region. Indian J Dent Res 2009;20:238-40. Hovland EJ, Block RM. 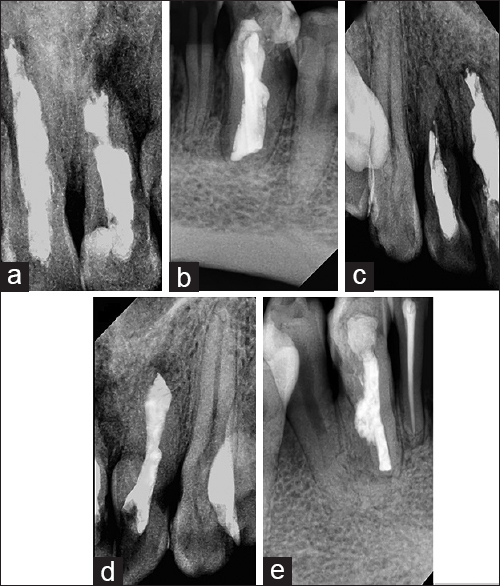 Nonrecognition and subsequent endodontic treatment of dens invaginatus. J Endod 1977;3:360-2. Rotstein I, Stabholz A, Heling I, Friedman S. Clinical considerations in the treatment of dens invaginatus. Endod Dent Traumatol 1987;3:249-54. Beltes P. Endodontic treatment in three cases of dens invaginatus. J Endod 1997;23:399-402. Hata G, Toda T. Treatment of dens invaginatus by endodontic therapy, apicocurettage, and retrofilling. J Endod 1987;13:469-72. Schmitz MS, Montagner F, Flores CB, Morari VH, Quesada GA, Gomes BP, et al. Management of dens invaginatus type I and open apex: Report of three cases. J Endod 2010;36:1079-85. Shadmehr E, Kiaani S, Mahdavian P. Nonsurgical endodontic treatment of a maxillary lateral incisor with dens invaginatus type II: A case report. Dent Res J (Isfahan) 2015;12:187-91. Coraini C, Mascarello T, de Palma CM, Gobbato EA, Costa R, de Micheli L, et al. Endodontic and periodontal treatment of dens invaginatus: Report of 2 clinical cases. G Ital Endod 2013;27:86-94. Fayazi S, Bayat-Movahed S, White SN. 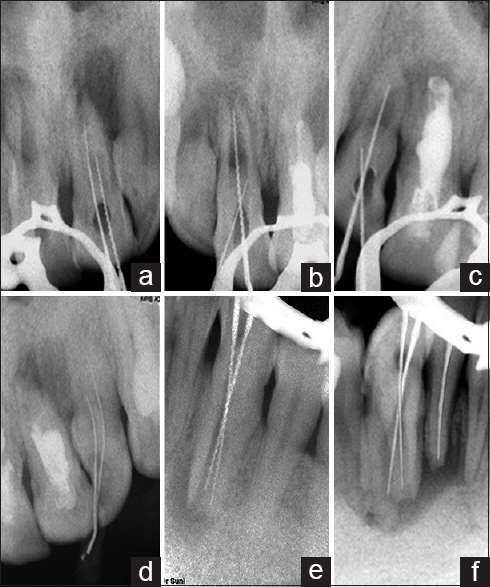 Rapid endodontic management of type II dens invaginatus using an MTA plug: A case report. Spec Care Dentist 2013;33:96-100. Abazarpour R, Parirokh M, Farhadi A, Jalali Z, Kheirabadi N. Successful ultra-conservative management of a mandibular premolar with dens invaginatus. Iran Endod J 2017;12:390-5. Skoner JR, Wallace JA. Dens invaginatus: Another use for the ultrasonic. J Endod 1994;20:138-40. Holland R, de Souza V. Ability of a new calcium hydroxide root canal filling material to induce hard tissue formation. J Endod 1985;11:535-43. Katebzadeh N, Sigurdsson A, Trope M. Radiographic evaluation of periapical healing after obturation of infected root canals: An in vivo study. Int Endod J 2000;33:60-6. Pace R, Giuliani V, Pini Prato L, Baccetti T, Pagavino G. Apical plug technique using mineral trioxide aggregate: Results from a case series. Int Endod J 2007;40:478-84. D'Arcangelo C, D'Amario M. Use of MTA for orthograde obturation of nonvital teeth with open apices: Report of two cases. Oral Surg Oral Med Oral Pathol Oral Radiol Endod 2007;104:e98-101. Torabinejad M, Hong CU, Lee SJ, Monsef M, Pitt Ford TR. Investigation of mineral trioxide aggregate for root-end filling in dogs. J Endod 1995;21:603-8. Saidon J, He J, Zhu Q, Safavi K, Spångberg LS. Cell and tissue reactions to mineral trioxide aggregate and Portland cement. Oral Surg Oral Med Oral Pathol Oral Radiol Endod 2003;95:483-9. Paula-Silva FW, Rocha CT, Flores DS, Nelson-Filho P, Silva LA, Queiroz AM, et al. Root canal treatment of an immature dens invaginatus with apical periodontitis: A case report. J Dent Child (Chic) 2011;78:66-70. Kumar H, Al-Ali M, Parashos P, Manton DJ. Management of 2 teeth diagnosed with dens invaginatus with regenerative endodontics and apexification in the same patient: A case report and review. J Endod 2014;40:725-31. Patel S, Horner K. The use of cone beam computed tomography in endodontics. Int Endod J 2009;42:755-6. Agrawal PK, Wankhade J, Warhadpande M. A rare case of type III dens invaginatus in a mandibular second premolar and its nonsurgical endodontic management by using cone-beam computed tomography: A case report. J Endod 2016;42:669-72. 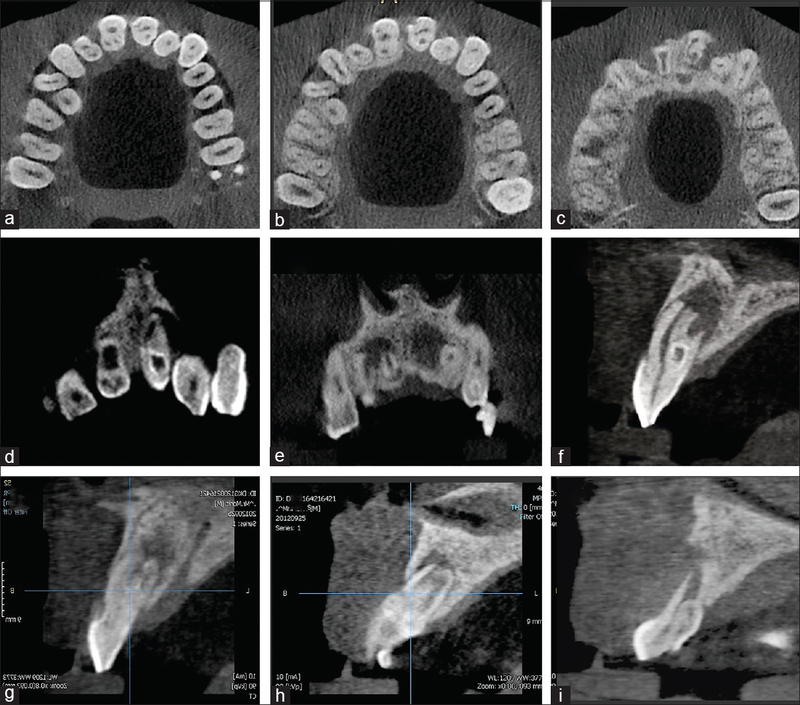 Durack C, Patel S. The use of cone beam computed tomography in the management of dens invaginatus affecting a strategic tooth in a patient affected by hypodontia: A case report. Int Endod J 2011;44:474-83. Patel S. The use of cone beam computed tomography in the conservative management of dens invaginatus: A case report. Int Endod J 2010;43:707-13. Verdun FR, Bochud F, Gundinchet F, Aroua A, Schnyder P, Meuli R, et al. Quality initiatives* radiation risk: What you should know to tell your patient. Radiographics 2008;28:1807-16.